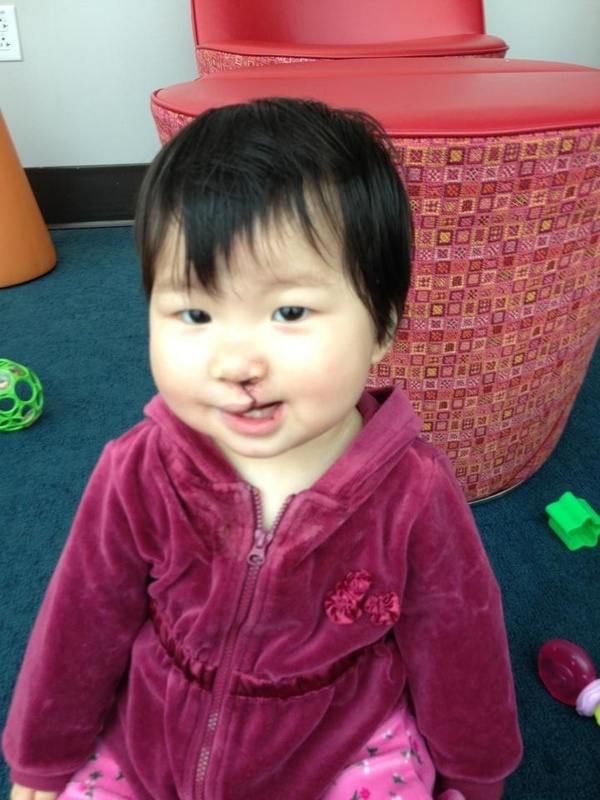 Maggie had surgery to repair her lip and nose on December 9th. Although it is past Christmas, I haven’t been able to blog about it yet as the post-surgery days were pretty hard, and as soon as we got past the worst of it all my kids got sick, one by one. On Christmas Eve I woke up sick, and it has taken all the time and energy I had to get through the post-op days, the sick days, and the holidays. Whew! 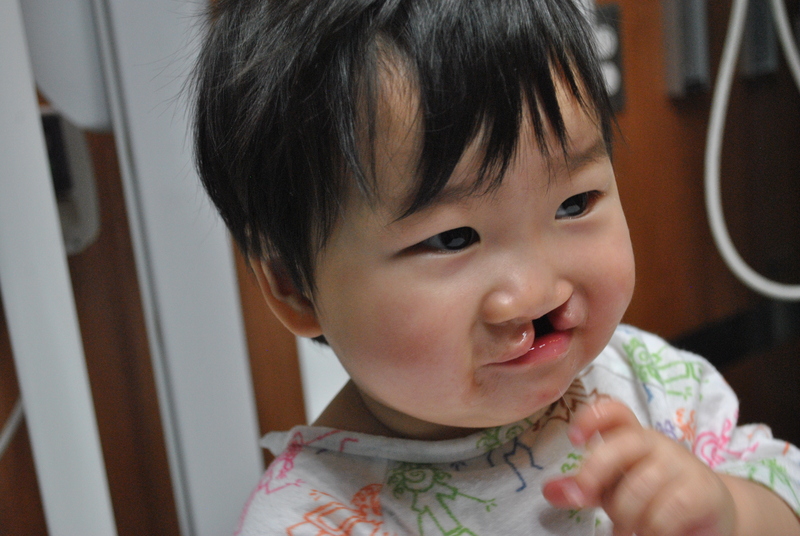 I do plan to blog about the surgery and recovery, but first I wanted to post some of our last pre-surgery photos. 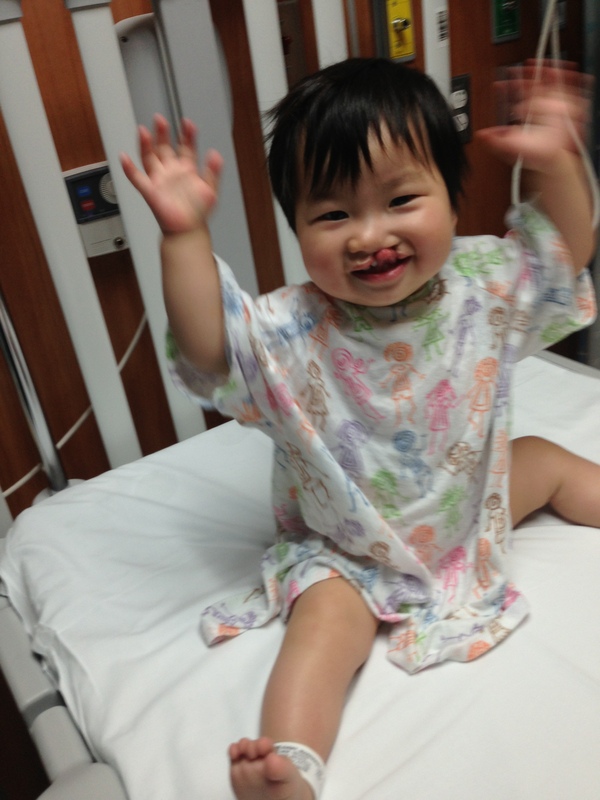 I cried a lot on the days leading up to surgery. I knew I would miss that big clefty smile that we had grown to love. Of course the surgery was necessary and far better for Maggie, but it was hard for me to know I would never kiss that sweet open mouth again. 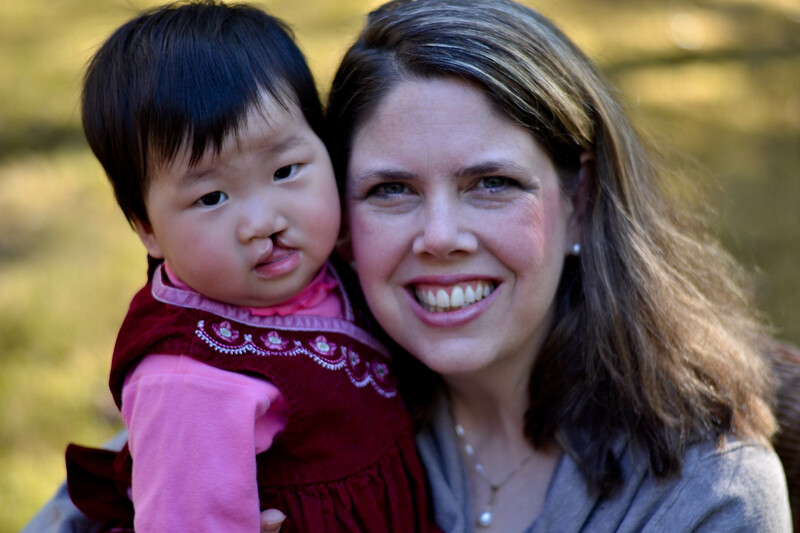 Many cleft mamas feel this way, and perhaps it is hard for others to understand. The baby I loved was changing, and I would never see her familiar smile again. 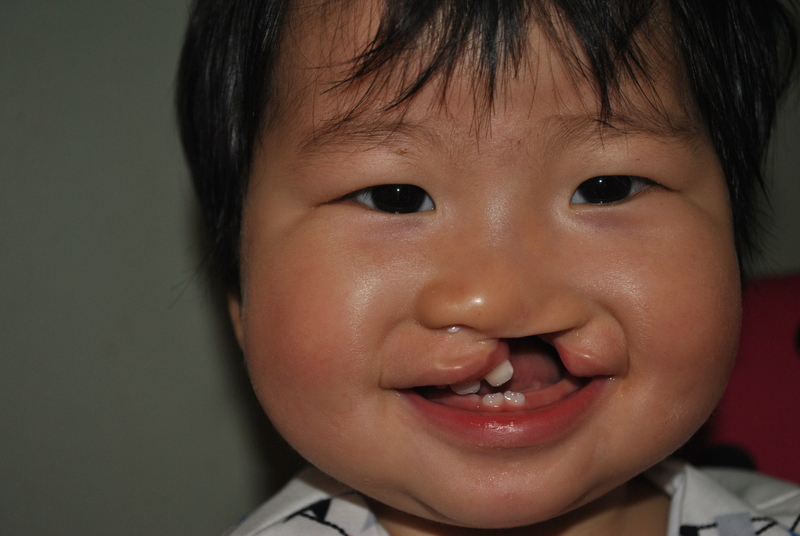 Even as I looked forward to her new, beautiful smile I mourned the loss of her sweet cleft smile. So I cried, and took as many photos as I could. I arranged for two photo shoots before our surgery day–one with Maggie alone, and another a few weeks later for our family Christmas photo. She had been home with us less than a month when we had her individual shoot. At that time, I thought she was bonding with us really well, and she was–but when I look back at those photos I can see how far she has come. I was only able to get her to smile once that day. In most of the photos she was serious and reserved. The contrast with her photo taken a few weeks later on our family photo shoot shows how much more comfortable she felt with us. 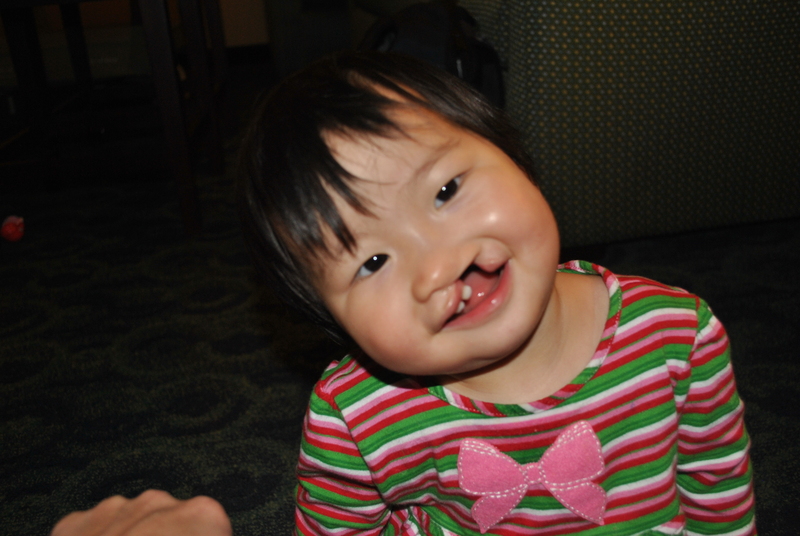 The days before surgery became a quest to get as many smiles out of her as possible. 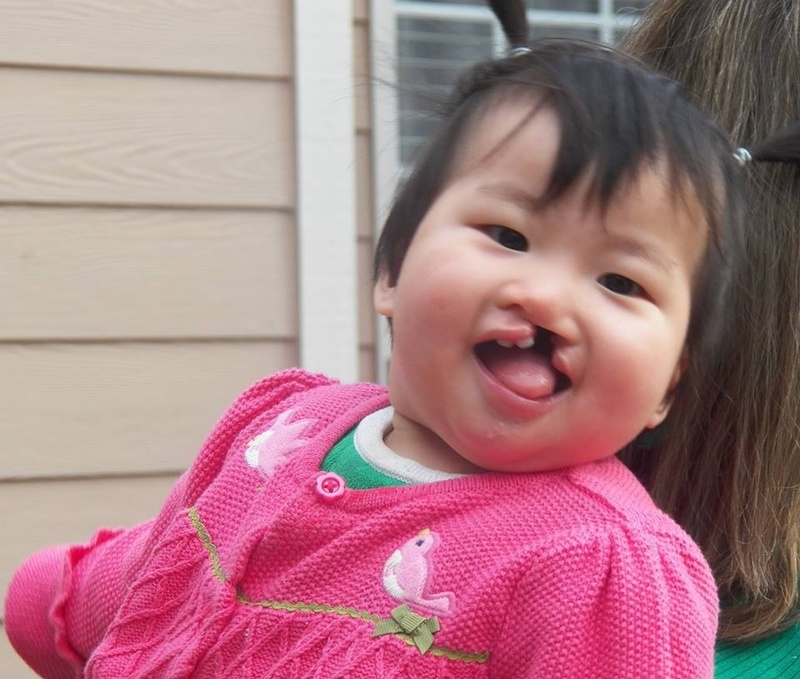 In this one you can see her cleft palate, which will be repaired in May…shortly after our oldest son’s high school graduation. Gulp. May will be a fog for me, I am sure. 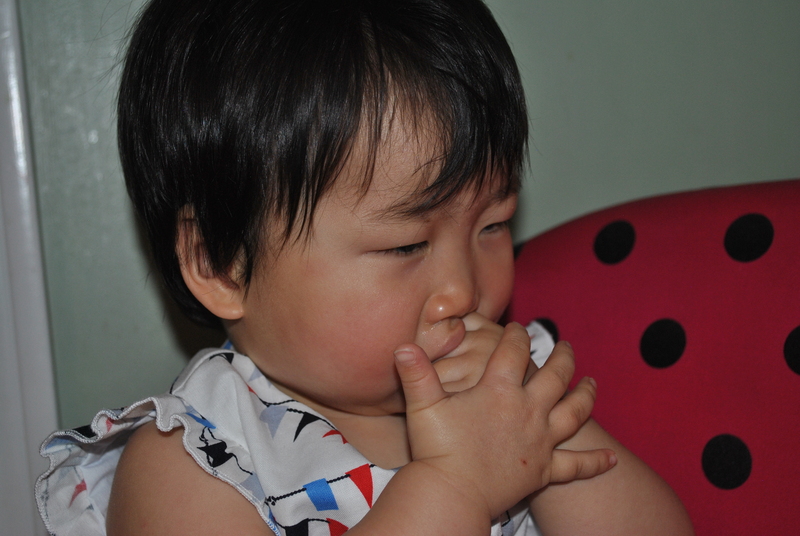 This is how she soothes herself…by sucking her knuckles and holding that hand with her other hand. After surgery she would have to wear arm restraints for 2 weeks to keep her from bending her elbows and reaching her stitches. I was very worried that she wouldn’t cope well with that. Here she is cocking her head to the side, like she does when she “flirts”. The alarm rang very early at 4:15 the morning of surgery. 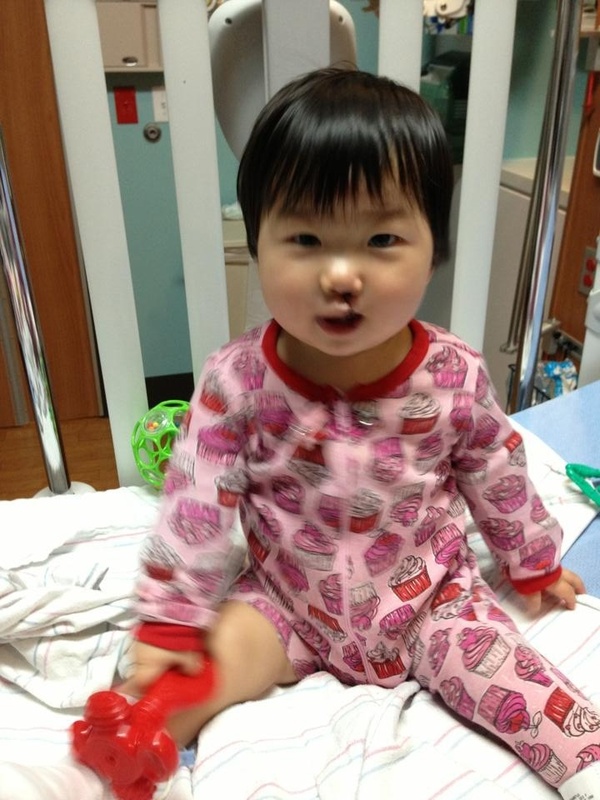 Time to get ready for her big day at UAB hospital! 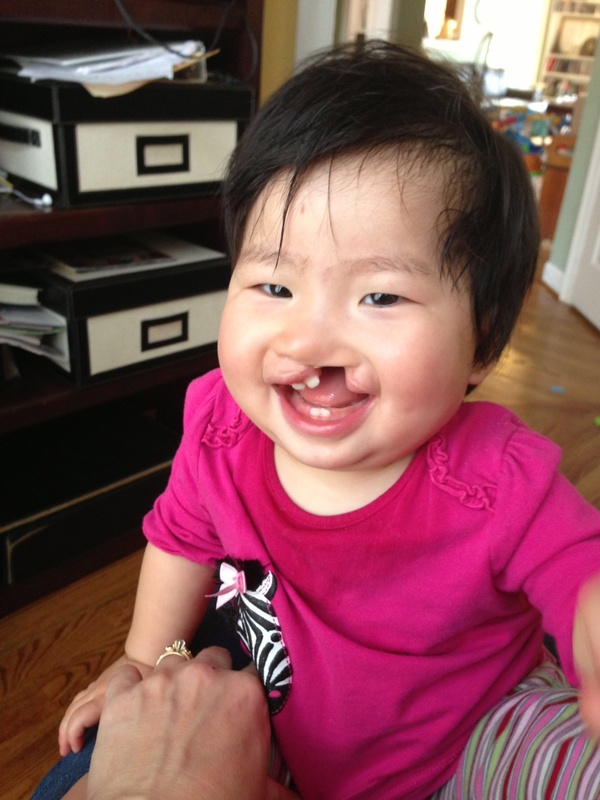 One more smile for mommy and daddy! 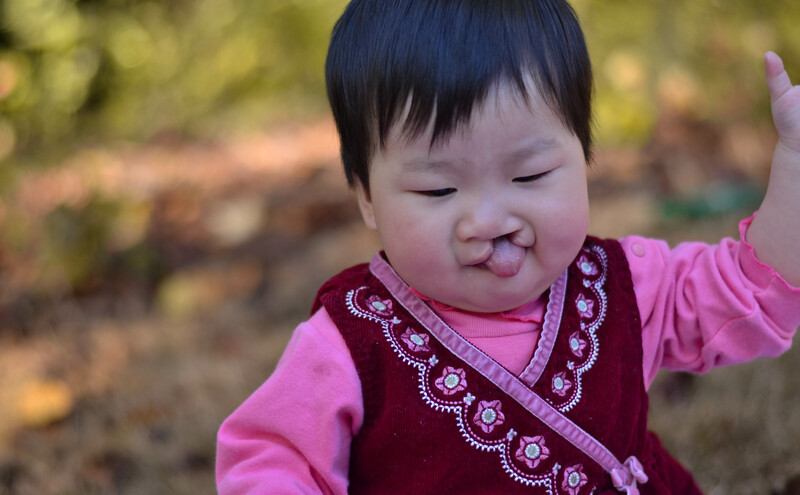 I was thankful to get a good photo of her tongue sticking out her cleft, which she loved to do regularly. At the hotel daddy got her to show she was “so big” all by herself! Up til now she had indicated it by only slightly moving her arms, and only when someone else was holding her hands to “help” her. 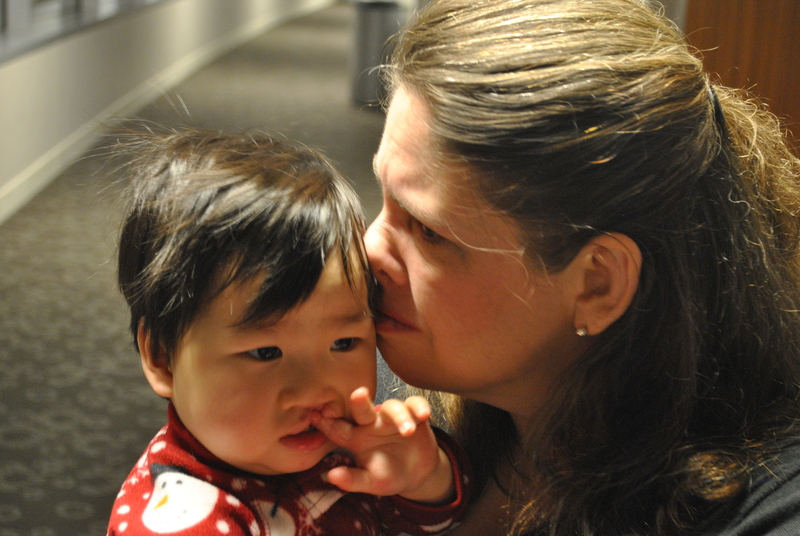 She learned to demonstrate how big she was just in time to comfort mommy before surgery. And then she was whisked away! We tried to get a final photo of the nurse taking her away but it all happened too fast. 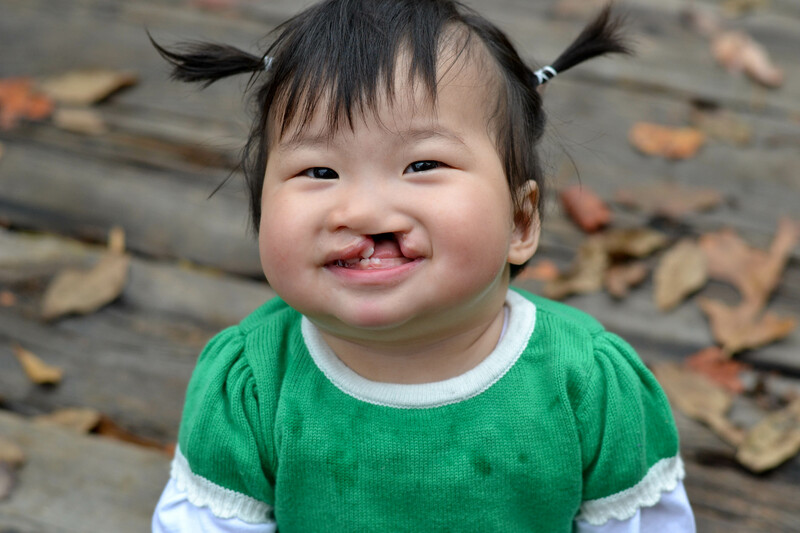 Just as fast, my tears of sadness over saying goodbye to her cleft smile gave way to anticipation and excitement about how my girl would look when the surgery was done. Maggie would rather play ball than sleep at 4 a.m.
Maggie had her surgery 3 days ago, on Monday December 9th. I plan to blog more about her surgery and recovery later, but free time is so very scarce right now, so this post will be about how our nights are going, and the encouragement that is getting me through. David was able to come to Birmingham for Maggie’s surgery and he spent most of the day with us. He had to leave that evening to get back to our other children, so I was alone with Maggie at the hospital. The night before surgery we arrived in Birmingham late, and didn’t get to bed until almost midnight. Our 4 am wake up call seemed far too early–I was already very tired and our journey was just beginning. On Monday night, after her surgery, she was on a pain medication regimen that included morphine through her IV and ibuprofen alternated with Tylenol with codeine, so that she was getting meds by mouth every three hours. After sleeping much of the day, she decided when we woke her at 2 am for her medicine that she had had enough sleep and wasn’t planning to go back down any time soon. There wasn’t much to do in the hospital in the middle of the night, and she was in pain and really only wanted to lay in mommy’s arms anyway. I was glad to hold her but SO very tired, and at times she was very fussy and inconsolable since she didn’t understand why she felt so miserable. The Lord was kind to remind me, on that night of all nights, that consoling this crying, fussy baby all night long was the ANSWER to my many prayers for her. I asked God for months to allow me to go to her so that I could STRENGTHEN her…and so that I might one day reap some harvest there, namely to see her put her trust in Christ. And now I was doing exactly that–strengthening my precious baby and sowing seeds of grace and peace into her life. I was not looking forward to being alone on Monday night and Tuesday. Maggie would be weaned off her morphine and she would be more wakeful and harder to console and entertain. I was also surprised that the children’s hospital in Birmingham did not provide guest meal trays, and I did not look forward to leaving Maggie to walk 15 minutes each way to the cafeteria to pick up food for myself! But the Lord sent TWO precious ladies to encourage and strengthen my spirit–and even to feed me–on Monday night and on Tuesday. I “knew” both of these ladies through my adoption connections, as they both adopted children from China through Lifeline Children’s Services, just as we did. One of them was staying on the same floor that I was on with her little girl, and we had an encouraging time of sharing on Monday night. Her husband brought breakfast for both of us on Tuesday morning–what a blessing that I didn’t have to leave Maggie! 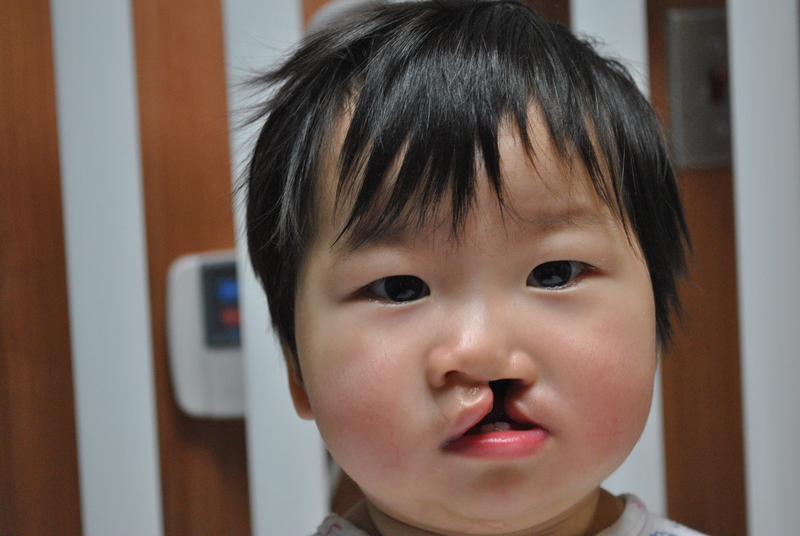 And at lunch time another precious Lifeline mama, whose son also has cleft lip and palate, came to the hospital and brought me lunch and a sweet care package with a video, popcorn, candy and a toy to take home to my other children. 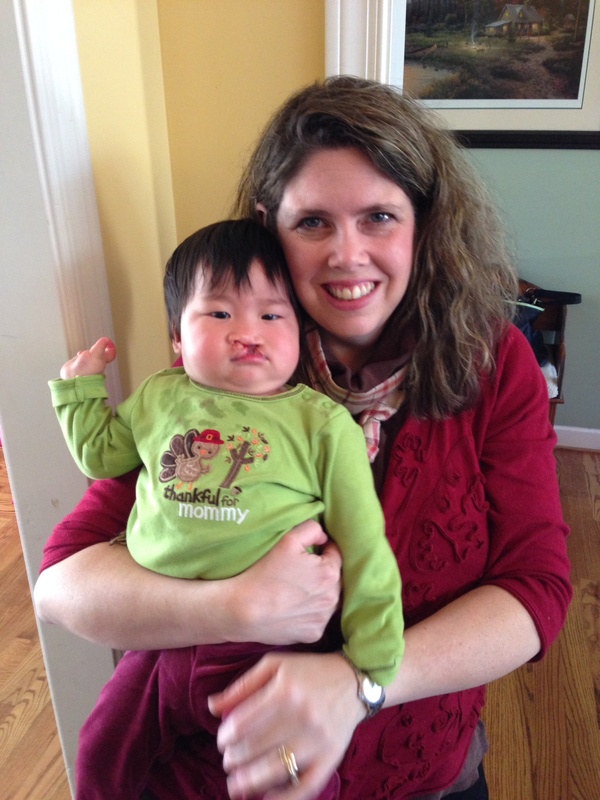 Even my nurse was an encouragement from God–a Chinese woman who had only been in this country for 5 years. Nurse Wei took great care of us all night long on Monday night. One day post-op, Tuesday December 10th. By Tuesday night we were back home. I stretched out Maggie’s medicine routine to give us five hours between doses instead of three, so that she and I could both get a little more sleep. It worked well, and she had a better night. I still set my alarm to ring every 30 to 60 minutes throughout most of the night to check on her. I was so worried that she would do damage to her stitches somehow rolling around in her bed. She is wearing restraints to keep her from being able to touch her face, but the first couple days she was very zealous to wriggle out of them, and needs to be watched like a hawk whenever she is awake. 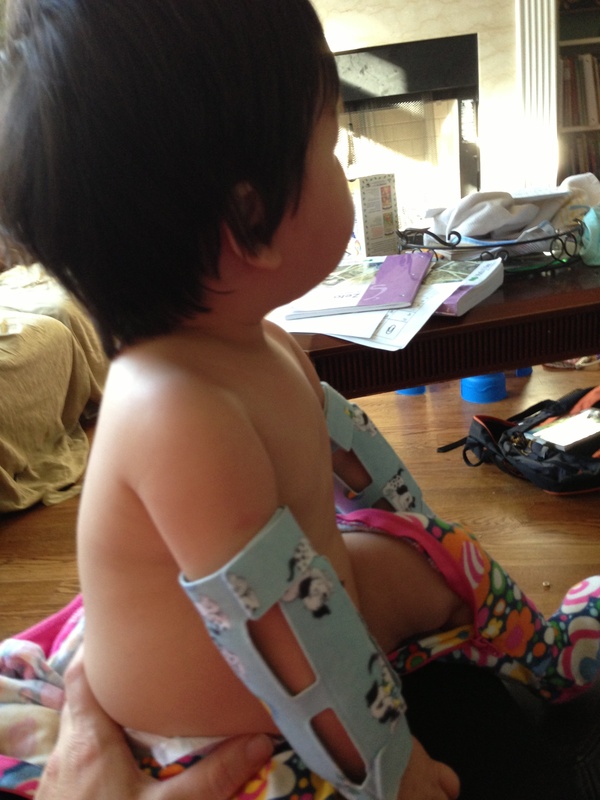 Maggie’s arm restraints, which keep her from touching her mouth as long as she doesn’t wriggle out of them. On Wednesday afternoon my Bible reading included Acts 3:20, which says “that times of refreshing may come from the presence of the Lord”, reminding me to turn to God when I need refreshment, rather than rely on my own faltering strength. Little did I know at that time that Wednesday night would be the hardest night yet. Some friends dropped off meals on Wednesday, and that was also such a blessing, enabling me to focus all my attention on Maggie now, which has been all-consuming. Maggie woke up at 1:50 a.m. on Wednesday night, very fussy. It was her first night without codeine, so I don’t know if that had anything to do with it. Her pain regimen last night was Ibuprofen and regular Tylenol, alternating. She didn’t want to rock and thrashed to try and get away from me, as she often does when she is afraid I am going to lay her down and she doesn’t want that. I took her out into the living room and she was content to ride in her swing for about an hour, as long as I laid right beside her. When I tried to get up to grab a sweater or blanket she became very agitated. By 3 a.m. she wanted out of her swing. The next couple of hours until I got her back to sleep at 5:30 are a bit of a blur. I tried to lay her down many times but she wanted none of it. She didn’t want to rock. She didn’t want a bottle. She didn’t want to eat. Additional medicine didn’t seem to help. She DID want to play for about 1 1/2 hours, so we did that. I tried the bottle again–this time with her favorite treat, PediaSure–and she took a few ounces, but refused to drink more and wouldn’t go to sleep. I have not wanted to let her cry in her bed at all at this time. She is so plaintive and so needy right now, and I want her to know that mommy is here for her. Also, if she is unhappy she thrashes about and I am worried she could do damage to her stitches, so our goal has been to build trust and help her stay calm. Around 4 a.m. I started to feel very nauseated, and I ended up getting David up a little before 5 because I felt like I was going to throw up. Maggie became so upset when we tried to trade off, so after a few minutes I ended up telling him to go back to bed and that I would handle it myself. These nights have been pretty rough on her, and she is telling us that only mommy will do. 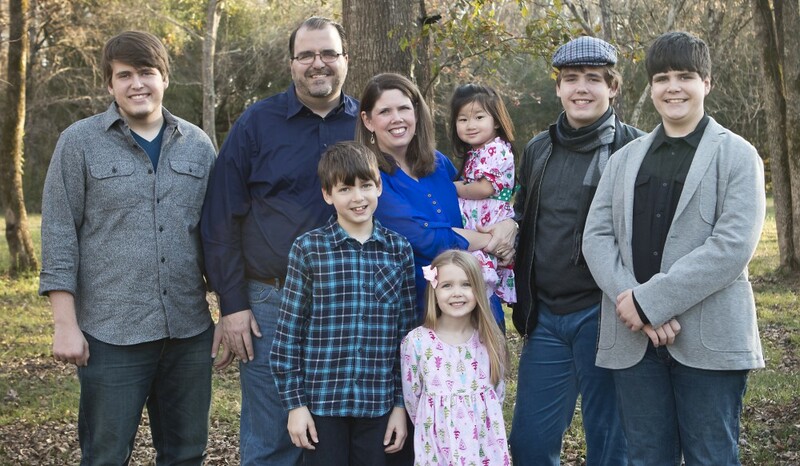 This, too, is an answer to prayer–we have been praying that her surgery would strengthen her bond with me, and that she would accept comfort from me. She is allowing me to comfort her and she shows a very strong preference now to be with mommy, especially at night. The low point came when I threw up six times, but after that I felt better and I was able to get her to take a little more of her bottle and then she lay down and went to sleep. What a relief! Although it was very tough physically to persevere through exhaustion and sickness, the Lord encouraged me and gave me “times of refreshing” in His presence. He reminded me often of 2 Corinthians 4:17, “For our light and momentary troubles are achieving for us an eternal glory that far outweighs them all.”. I also found great encouragement in knowing that this rough night was far better for Maggie than it would have been if she were enduring it alone in China, most likely without pain medications or anyone to comfort her. The Lord gave strength to my body and encouraged my spirit. And my husband rearranged his work schedule today to enable me to sleep until 11:00. I truly needed that, and I woke up able to face a new day. I have had many moments of weakness, too, collapsing in tears or reacting out of frustration. But I have been encouraged by how the Lord has answered the prayers of His people, using His Word and other Christians to buoy my spirits and enable me to persevere during these long, tiring nights. Thursday has drawn to a close and Maggie is sound asleep in bed. I am headed that way, too, and praying for a better night tonight! As of this Monday, December 9th, we will have had Maggie for 3 months. The time has raced by, and I can hardly believe it has been that long! Yet in another way it feels as if she has always been with us. I am thankful to God that her adjustment to our family has been so easy and our attachment is already so strong. I am thrilled that she has a tight bond with all our children. They have all taken to often calling her “Little Mags” or just “Mags” for short. 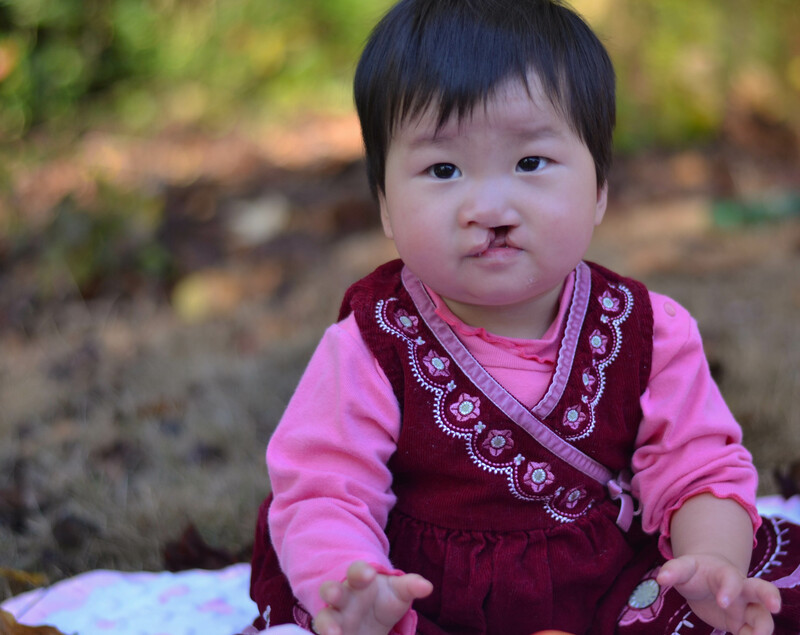 We will be “celebrating” our 3 month anniversary with Maggie in Birmingham on Monday, where she will be having her first surgery to repair her lip and nose. 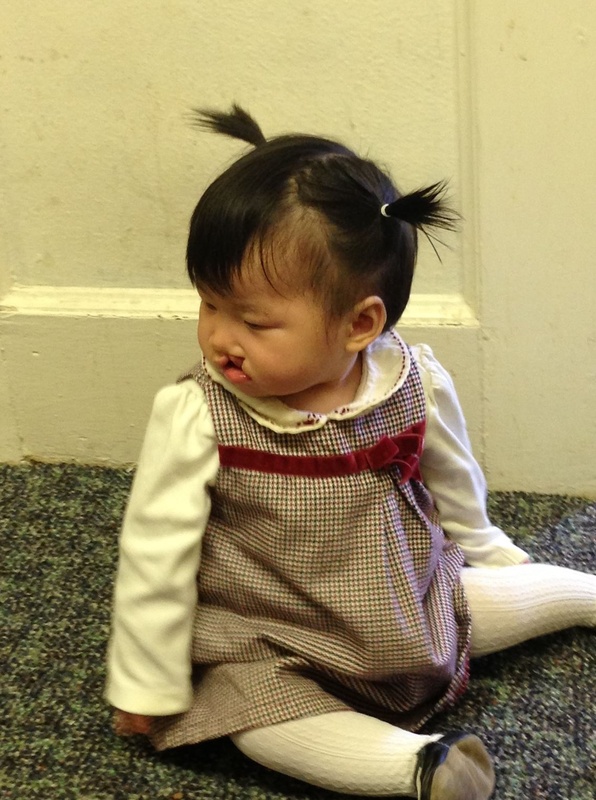 She will also get tubes in her ears and the audiologist will perform a special test of her hearing nerve while she is under anesthesia since she did not pass her first hearing screen. 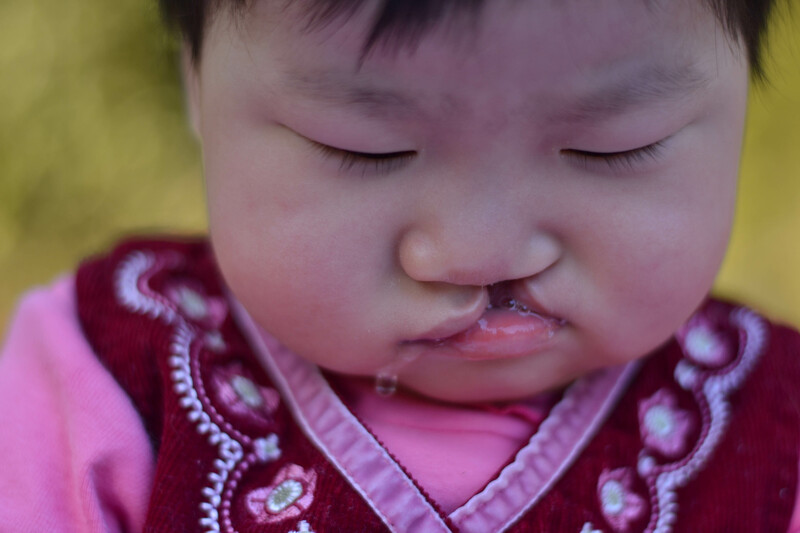 Please join us in praying that her surgery will go well, that recovery will be smooth, and that she will have no permanent hearing loss. Maggie’s first Thanksgiving. Look at how much weight she has already gained! 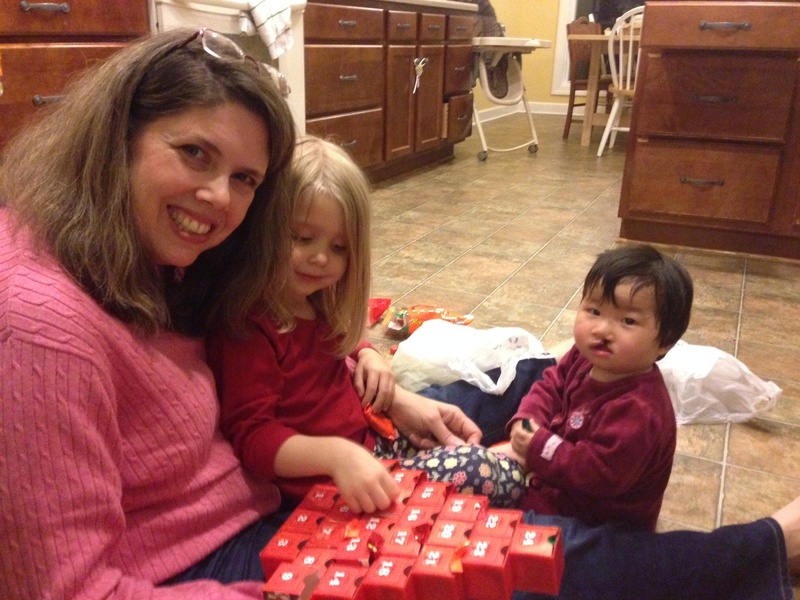 Three weeks ago we went back to the occupational therapist at the International Adoption clinic. She gave me some new exercises to work on with Maggie. 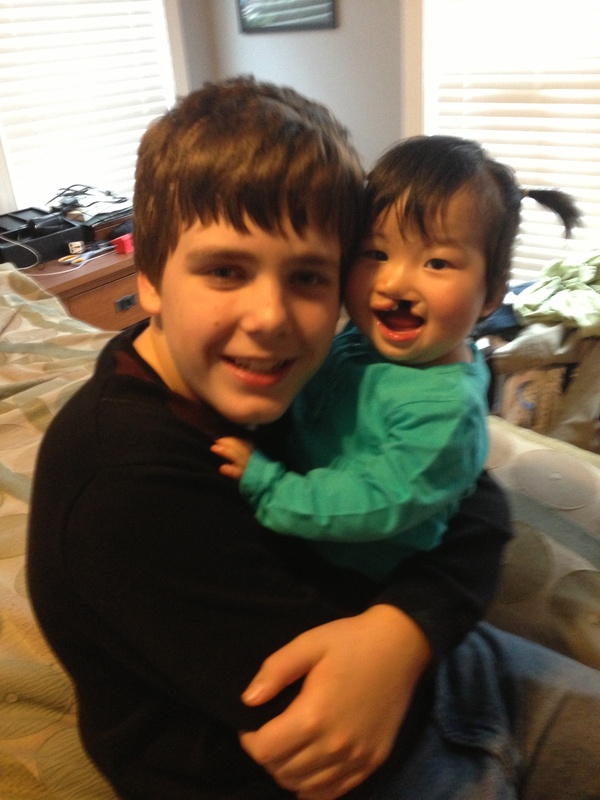 In the past three weeks I have seen her continue to get stronger and stronger–she is amazing me! She still sits on her yoga ball and bounces for several minutes once or twice a day. When we started these exercises in October I had to hold her under her arms by her rib cage, and eventually I was able to hold her by the hips–now her stomach muscles have gotten so strong that I can hold her thighs while she bounces. To strengthen her core further, after a minute or two of bouncing, I roll the ball to either side and back, while she is still sitting on it, so she has to stretch to counter the movement and keep from sliding off. 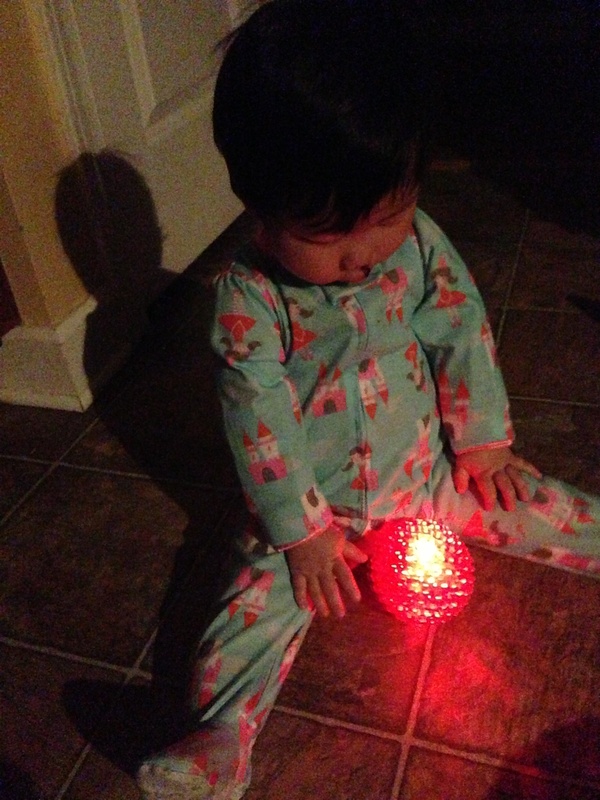 Of course I am holding her–but if I roll the ball to the left, she leans to the right to keep her balance. This exercise has been great for her, and she loves it! She also still spends some time up on her knees while on the ball, and she surprised me about a week ago by getting up on her hands all by herself while she was on the ball–usually I have to pull her hands up under her after I get her up on her knees. This week she even got into a crawling position once all by herself on the floor. She didn’t stay that way for long, but this is a big step for a little girl who could not tolerate being on her knees for even a second just a couple short months ago. 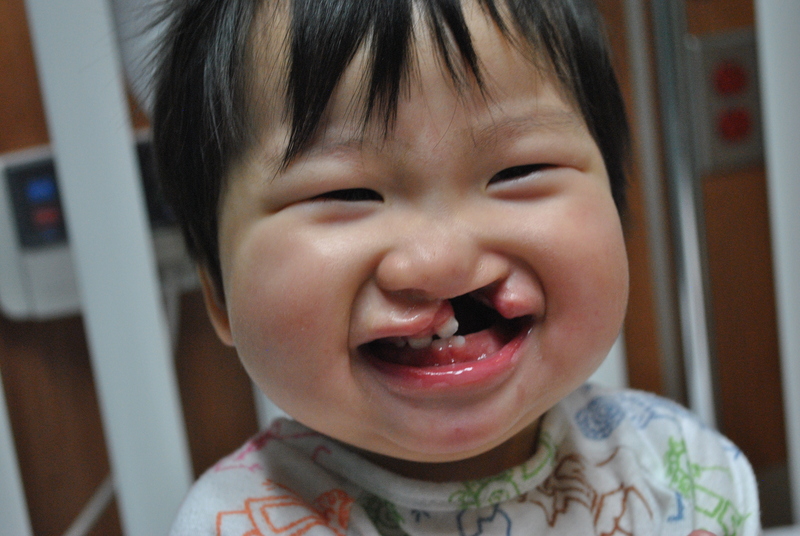 I will truly miss this sweet smile! She loves doing her exercises now! She laughs with glee and smiles to herself, and puffs up her chest proudly when she does a good job. Sometimes she even claps for herself! 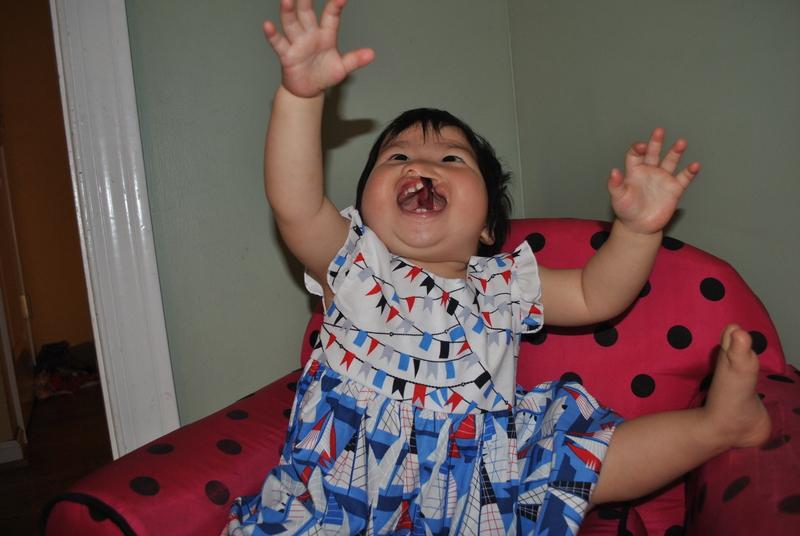 She has started sitting straight up (from a lying down position) sometimes when she is on my lap, and yesterday she did it without even needing help–once again, it is because her stomach muscles are getting stronger so she can sit straight up without needing help! 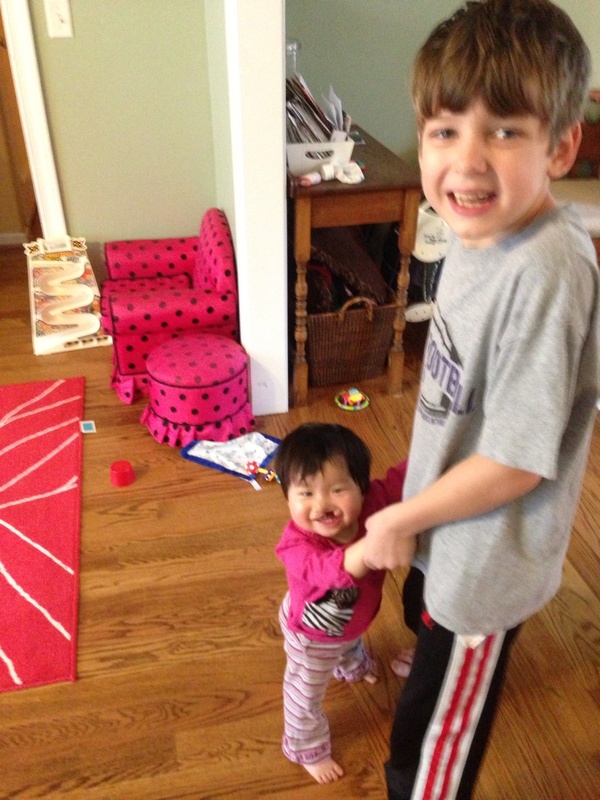 She is trying to pull up to stand–unsuccessfully so far, but she is trying. If I put her in a standing position she can stay that way without any help or support for quite awhile–several minutes. She even trusts herself enough to let go with one hand if she wants to reach for something. She can do this with either hand while on her knees now in a crawling position, too. Mags has invented a new way of “crawling” since she still isn’t comfortable moving on all fours. For quite awhile she did an army crawl, pulling herself along with her arms. Now she scoots all over on her rear end, pulling herself along by stretching out her feet and then bending her knees to scoot forward. She has gotten pretty quick, and can’t be left unattended for a moment anymore. It used to be that wherever she was placed, there she would stay–but now she has become quite mobile. Her fine motor skills are getting better, too. 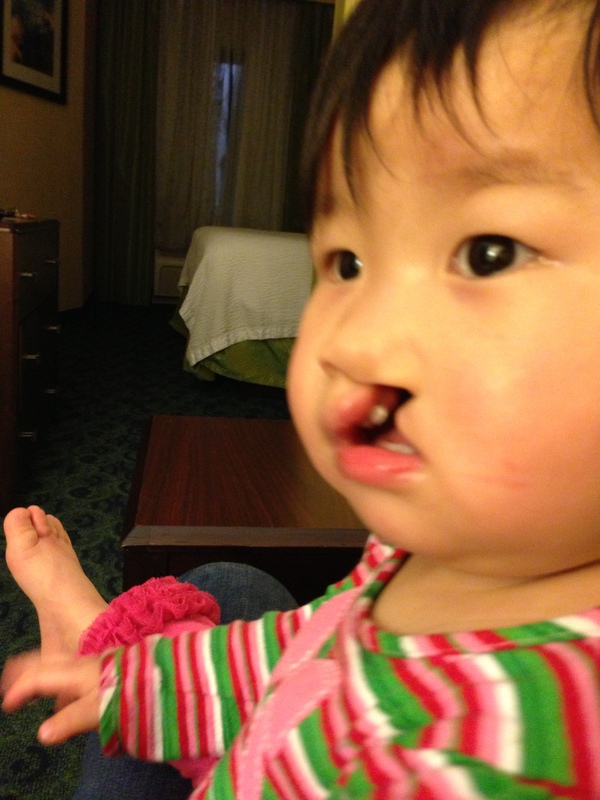 When we met her almost three months ago she couldn’t hold anything in her fingers, and she couldn’t find her own mouth. Now we have to watch her like a hawk as she finds popcorn seeds and bits of paper on the floor and easily gets them into her mouth. She has gotten more teeth–two more have started to poke through (one on top, one on bottom) in the past two weeks, for a grand total of six now. Her hair is getting longer and can be put into little pony tails. She is such a cutie pie! We have been working on sign language, too, and she can wave bye bye, can sign “all done”, and she often claps to imitate the sign for “more”. We are currently working on teaching the sign for “thirsty”. 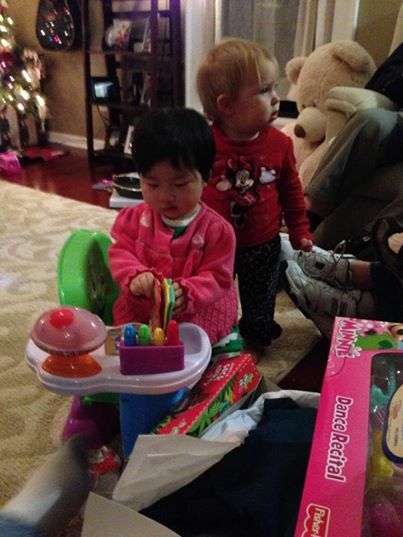 She is playing more and interacting so much more with her environment. We can see the wheels turning in her brain, and it is a joy to watch. She is so smart and so determined. She never misses a trick and doesn’t easily forget her purposes even when we try to distract her. Sometimes I even wonder if she is plotting how she will accomplish her goals. For example, she has been redirected dozens of times for trying to pull on electrical cords. As soon as we brought our Christmas tree upstairs she immediately noticed that it had a dangling cord (which hadn’t been plugged in yet as it was brought up in pieces). She headed straight for that cord as fast as she could go, intent on accomplishing her ultimate goal of tasting an electrical cord. Of course she was quickly caught–she always seems surprised that we can guess what she is up to! Sleep problems have continued but they are definitely getting MUCH better than they were two weeks ago when I wrote my last post. I am still having some trouble laying her down–if she gets overtired and starts to fall asleep while drinking her bottle I can usually count on it not going well. If she falls asleep or dozes in my arms, she HATES for me to lay her down. I wish I could hold her for two hours while she naps but since she is our sixth child that is usually nigh on impossible. I have gotten pretty good at transferring her to her bed without waking her, but it isn’t foolproof and if she does wake up she is so upset about being laid down by mommy that she often won’t go back to sleep at all. I have more success if I can keep her awake until time to lay down. She complains a little bit about that but she usually goes right to sleep pretty quickly. This is what we are dealing with both at night and at nap time. Sometimes she is waking up now with what I think may be a night terror–I am not sure. She wakes up crying sometimes and yet her eyes are closed and she doesn’t seem to really be “awake”. If I can get to her quickly and rock her in my arms from side to side while her eyes are still closed I can often get her to go right back to sleep and to stop crying almost immediately. If she opens her eyes, though, it is like she “wakes up” and then it can take a long time to get her back down–and if it happens at nap time then she typically won’t go back down at all. I didn’t realize we would still be dealing with sleep issues three months out and that part has been hard. I am very tired. Our 3 year old daughter is doing better about sleeping through the night but she is still waking me up once in the night about 50% of the time. This is improvement, but I am often up with one of them and sometimes still with both. I have had a couple nights in recent memory where both girls slept all night, and that was wonderful. That is the goal we are aiming for, and I hope we will get there soon! At this point, our older bio daughter is waking me up more often than our adopted daughter. I had a slight worry last week that her bonding with me was suffering because I have been much busier lately now that our “cocooning time” is past. There have been times when I feared she was attaching more to the kids and was not as interested in being with me. I have struggled, too, when she refuses to sleep for me. Her sleep patterns are getting much better but for awhile there she was waking up and refusing to be comforted by me–arching her back and kicking to get away from me, but shrieking in anguish if I dared to put her down. That was frustrating and didn’t feel too good. Thankfully I realized how it was affecting me and had a good talk with the post adoption counselor at Lifeline. She gave me some tips and ideas and, most of all, support. I know there are times, such as during night terrors, when a child cannot be comforted–but we are there to offer comfort anyway, even if it is rebuffed. I have experimented and found some positions she likes to be held in, which almost always calm her down fairly quickly. That is helping, too. Moving her into her own room has been a big help–she doesn’t wake nearly so often now that she isn’t sleeping in our room. After working through these issues for a couple weeks, now she is much more easily comforted when she wakes up. Maybe I have learned her preferences or she has learned to relax when I am there–or maybe both. Her nighttime rages have stopped and when she does cry out for me she wants my comfort. She is no longer trying to get me to play with her half the night, either–she seems to have accepted that nighttime is for sleeping. Bonding is a two way street–if she pulls away from me it will make me feel further from her, and vice versa. I made a conscious effort to slow down and try to have more face time with her, and to carry her more. It is getting hard to carry her now that she is well past 20 pounds, and my 43 year old back is definitely feeling it. But she has responded well to me slowing down a bit more again, and our bonding is back on track and going great. 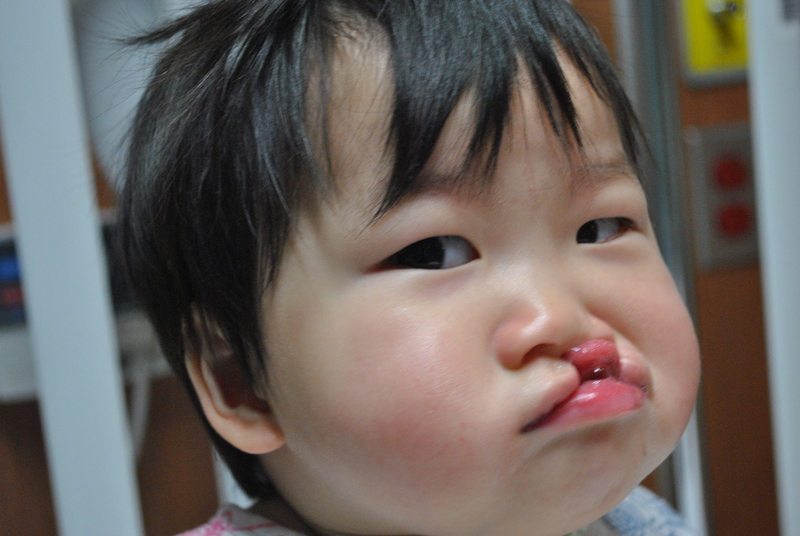 Maggie’s lip and nose surgery is coming up quickly. It will likely help in her attachment process. She will be in pain and I will be there to comfort her. That cycle of her needing help and me meeting her need should continue to reinforce her trust in me.